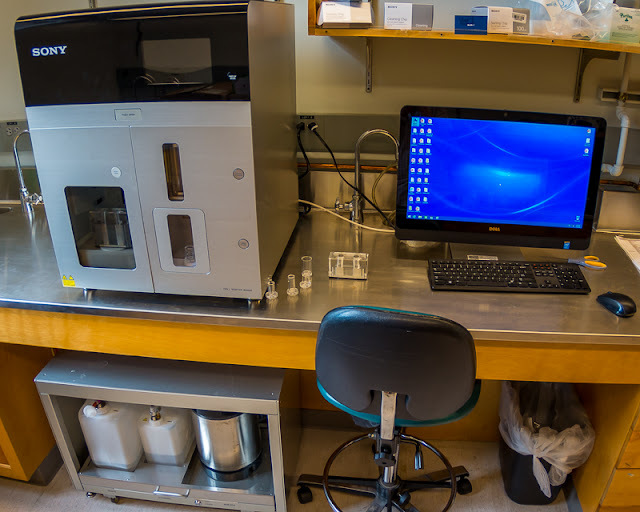 The GC3F houses two flow cytometers: a Sony SH800 cell sorter and a first-generation Applied Biosystems Attune Cytometer. Both instruments are user-operated, and the SH800 also requires prior reservation. The GC3F provides training on both (email Jeff Bishop jbishop2@uoregon.edu to schedule a training session), but it is up to you to analyze and sort your own cells. Both the Sony and Attune are intuitive, user-friendly instruments, so don’t be afraid to get trained and analyze your cells! The Sony SH800 is a cell sorter capable of distinguishing up to 6 different fluorescent markers (excited by 4 lasers: red, green, violet, and blue) in a mixed population of cells. Alignment and calibration are all handled automatically using disposable optical plastic sorting chips that are based on Sony Blu-ray technology from the home consumer electronics realm. The SH800 can sort cells in to two collection tubes at a time, and is capable of sterile sorting following an approximately 2.5 hour long instrument decontamination procedure. The cost for Internal users (UO, OSU, and OHSU) on the Sony SH800 is $40 per hour, plus $35 for a sorting chip (either 100µm or 130µm size). 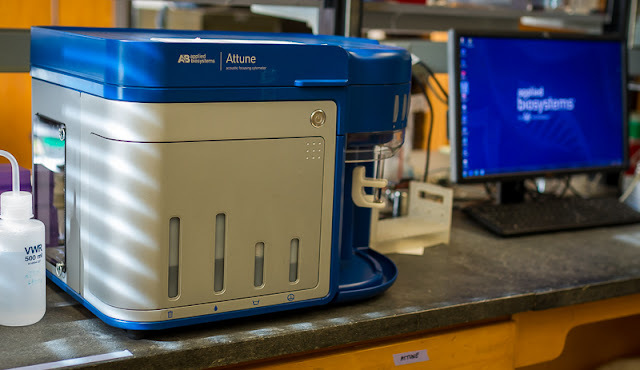 The Applied Biosystems Attune cytometer is an analytical cytometer (not capable of sorting) that can measure fluorescent markers that are excited by blue or violet lasers. This instrument is a good alternative to the Sony if sorting is not needed, and the panel of fluorescent markers does not require the 6 detectors of the Sony. We do not charge for usage time or reagents on the Attune instrument!